Custom graphics, multi lingual messages. Due to the manufacturing processes we use custom speed sign production is a simple and cost effective option. Whether you want a specific type of graphic or need to change the wording or language of your message, custom production allows you the flexibility to have almost anything you want. There are no printed circuit boards full of led diodes fixed into sets of permanent message designs. Using a different method of led assembly means that you can have a custom speed sign made with a short lead time and no minimum order. Outer casings are made by CNC drilling blank aluminium panels so producing a different hole pattern is easily done. Custom speed sign manufacturing is very useful if you want to use radar detection and speed calculation techniques in a different way, to regulate for unusual dangers or for specific road users. 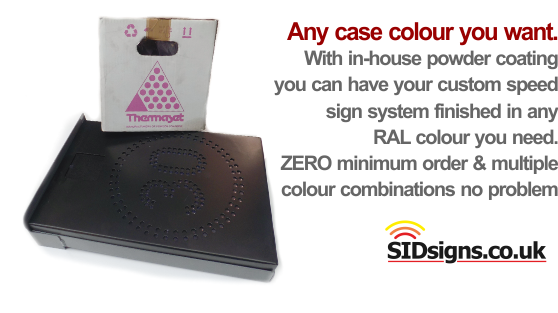 Complimenting the production of custom led message panels is the ability to deliver a custom powder coating solution with no minimum order using any RAL colour. Custom colours are useful for speed signs which are destined for sensitive areas or applications where corporate colours need to be followed. All powder coating processes are handled in-house so you are welcome to ask for the colours which suit you. Part of the custom speed sign production service on offer is that of rebranding; putting your details on a plain, vanilla sid sign. If you need to supply speed signs to your clients and would like your own "brand" products we can help. Call or email for more information. Speed signs can be designed with custom brackets, special shapes, non standard sizes. Looking for a hybrid solution? 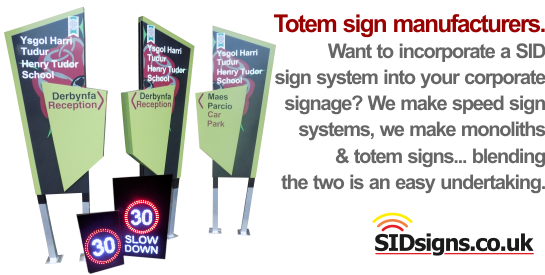 Why not incorporate a dynamic sid display into your next corporate monolith or totem sign? There are endless possibilities and we're ready to help you get anything you need.